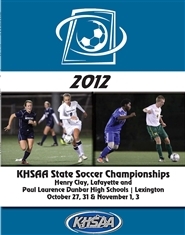 This is the official program from the 2012 KHSAA Soccer State Championship. This version is in black and white, inside and out, and has been updated with 2012 results. This is the official program from the 2012 KHSAA Volleyball State Championship. This version is full color, inside and out, and has been updated with 2012 results. This is the official program from the 2012 KHSAA Volleyball State Championship. This version is in black and white, inside and out, and has been updated with 2012 results. This is the official program from the 2012 Leachman Buick-GMC-Cadillac/KHSAA Golf Championships. 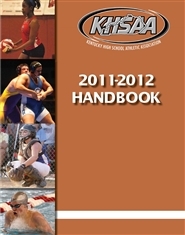 This version is full color, inside and out, and has been updated with 2012 results. 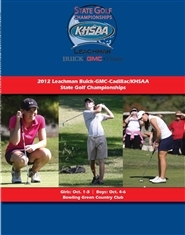 This is the official program from the 2012 Leachman Buick-GMC-Cadillac/KHSAA Golf Championships. This version is in black and white, inside and out, and has been updated with 2012 results. This is the official program from the 2012 Russell Athletic/KHSAA Gridiron Bowl. 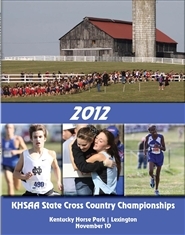 This version is full color, inside and out, and has been updated with 2012 results.